David Ocheskey had three loves in his life; his wife, Mary Ocheskey, his family, and watching his grandchildren play sports at New Haven High School. Pictured right (left to right): Dave and Mary and their three daughters Lori Quick, Michele Scheer, Renee Laune. For nearly two decades Dave attended hundreds of his grandkid’s games, from their very first game to their senior year as they finished their Shamrock careers. Rarely did Dave miss a game and never was there a time when his wife was not with him. Mary loved watching them play just as much as Dave did; it was a special bond they both shared. At games you would find Dave sitting up on the top row of the bleachers with his white polo shirt; embroidered on it the Shamrock emblem and words “New Haven Shamrocks". Mar., 4, 2011 at the Girls Class 2 District Championship Game in Perryville, Mo. would end up being the last time Dave would ever watch a grandchild play in a Shamrock jersey. He and his wife made the long trip to watch their granddaughter, Julie Scheer, play her last game as a Lady Shamrock. It was on Saturday, April 23, 2011 that Dave Ocheskey passed away after two years of fighting cancer, never letting his illness get in the way from going to every game possible. His stubborn and strong willed personality, regardless of how well he felt, never kept him from enjoying every second of his life. He died a man who could honestly say, he had worked for everything he had. After his death the Ocheskey family wanted to give back to New Haven High School because of all the memories, great times and excitement the high school had given Dave and his family. Pictured left: One of the individual tiles around the shamrock for each State Championship Won. 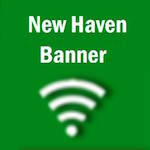 Tim Stobel, New Haven High School Principal, had the idea of a shamrock in the center of the cafeteria, with a green tile around the it for every state championship New Haven had won. The Ocheskey family could not have thought of a better way to honor their dad, grandpa, and husband than funding the project in David Ocheskey’s memory because he was and always will be a Shamrock fan forever.